Acrobat 8.1.2 fails to work on Vista x64 SP-1. It causes the print spooler to fail. To fix your 8.1.2 problem. this is the same on Windows XP 64 with Acrobat 8.1.2. 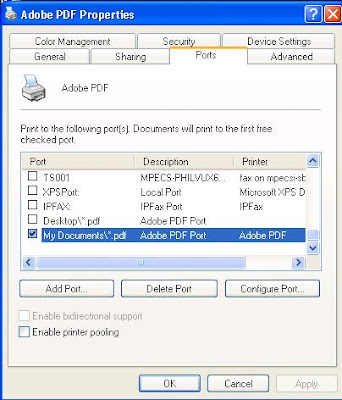 Adobe PDF Properties -> Printing Preferences and choosing a folder makes it working! Thank you so much for your help, this was totally annoying! I have given up trying to get Acrobat to publish PDFs to a selected folder for now. 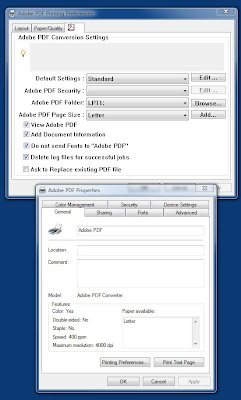 At this point, we set Acrobat to publish to a specific directory then rename and move the PDF from there. A little cumbersome, but it works. I don't have an Adobe 8.1.2 CD but 8.0 so I don't think the printer gets installed correctly. Prior to this printing anything to the adobe printer would just lock up whatever application I was using which was a big pain in the _____. I tried everything. The only thing that worked for me is removing the pdf printer, then goint to acrobat, help, repair acrobat installation. Thanks for the tip! Like the last 2 comments - I deleted the Adobe printer, ran a repair and finally got the adobe printer to work on vista sp1. 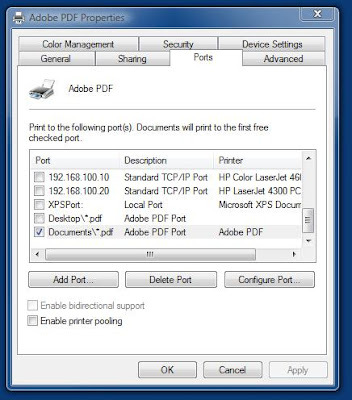 Before getting it to work, the printer would freeze on spooling and lock whatever application that was using the adobe printer.